How to open and Invest in NPS Account? Budget 2015 provided for additional exemption of Rs 50,000 for investing in NPS (National Pension Scheme) Tier 1 account u/s 80CCD(1B). This was to encourage NPS as popular retirement planning option. And we all know anything related to tax saving automatically becomes a popular investment avenue. In an earlier post we had highlighted why you should invest in equity mutual funds than NPS, but still I got people who were interested in opening NPS account and take advantage of Section 80CCD(1B). This post tells you how to open and invest in NPS? 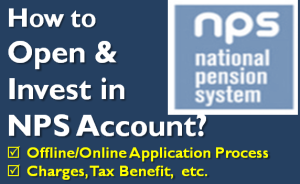 NPS account can be opened by anyone with age between 18 to 60 years. Even NRIs are eligible to open NPS accounts. NRIs can invest through normal banking channels or out of funds held in their NRE/FCNR/NRO account. Tier -I account is the primary account and the contribution to this account is locked till retirement. Tier- II account is optional saving account and deposit and withdrawal to this account can be done anytime. There are 4 types of account depending on type of subscriber. The good news is opening NPS account is relatively simple. You can download the NPS application form by clicking here. After filling the form you can submit it to your nearest Point Of Presence – Service Provider (POP-SP) along with your PAN card, address proof, cancelled cheque and cheque for initial deposit. How to fill NPS Account Opening Form? The NPS account opening form is 4 page simple form. The first page asks for Personal Details, Address, contact details and bank details. Page 2 has nomination details, NPS option, Pension Fund Selection and investment option selection. Page 3 is just KYC verification by POP-SP. Page 4 is the instruction page. Out of the above 7 only LIC, SBI and UTI are available for Government employees while all 7 are available for all other NPS accounts. There are 3 types of assets you can invest into. Asset Class E– Investment in predominantly equity market instrument. You need to select between active and auto investment choice. Active Choice – in this case you can select the allocation between the above 3 asset classes. You can invest maximum of 50% in Asset Class E.
Auto Choice – in case of auto choice the allocation between assets happen based on the age of the subscriber. Till the age of 35 years the allocation is 50% in Class E, 30% in Class C and 20% in Class G. every year the asset distribution is changed such that Class E is reduced by 2%, Class C reduced by 1% and Class G increased by 3%. 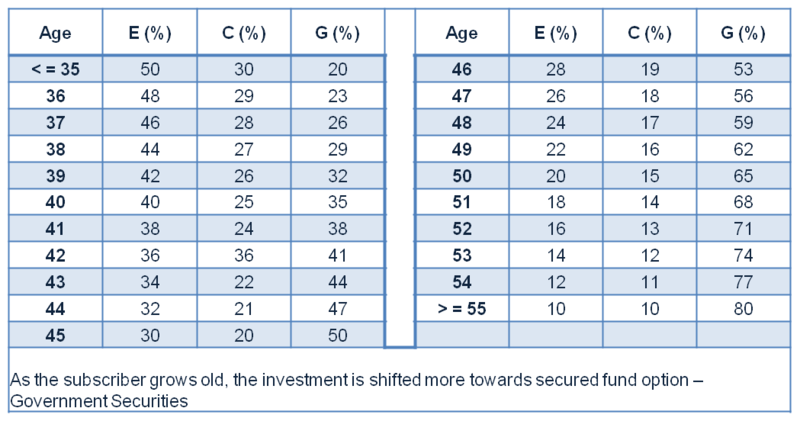 At the age of 55, there is only 10% invested in Class E and C each and rest 80% is in Class G. The above asset distribution is done to keep the volatility to the minimum as the subscriber reaches withdrawal stage. NPS subscribers can make changes to the asset allocation (percentage distribution between Class E, C and G) and also change their fund managers once every financial year free of cost. You can also open NPS account online if you have internet banking enabled for any of the 10 participating banks – Allahabad Bank, Bank of India, Bank of Maharashtra, Oriental Bank of Commerce, South Indian Bank, State Bank of Travancore, State Bank of Hyderabad, State Bank of Patiala, Tamilnadu Mercantile Bank and United Bank of India. .
Just go to eNPS website, fill up the form and make the initial contribution. What after NPS Form Submission? 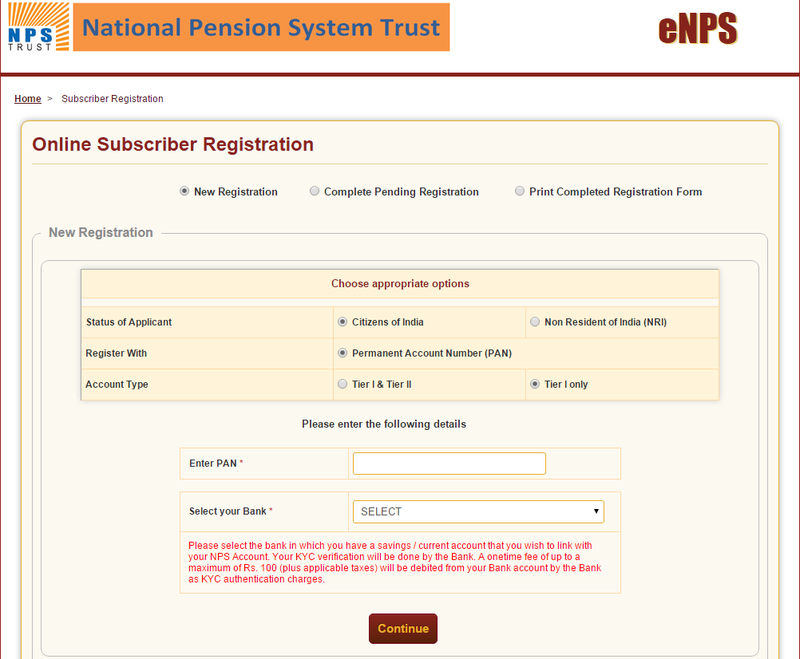 On submission of NPS form, a 17 digit Permanent Retirement Account Number (PRAN) will be allotted to you. Within 2-3 weeks you would get welcome kit containing a PRAN Card, IPIN/TPIN, Subscriber Master Report, Scheme Information Booklet along with a Welcome Letter through post. All the active NPS account holders can do subsequent contributions online. For every contribution, you need to authenticate PRAN using the OTP sent on the registered mobile number. Next you can pay using your debit card or internet banking. The initial contribution has to be made at the time of submitting the form at the POP-SP. The initial contribution should be minimum Rs 500 for Tier-I account and Rs 1,000 for Tier-II account. Thereafter you should contribute at least once every year in both Tier-I and Tier-II (if opened) account. 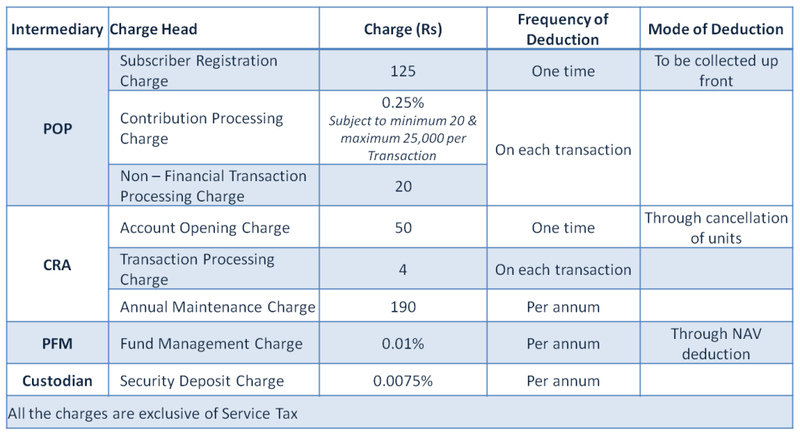 The minimum contribution should be rs 500 for Tier-I account and Rs 250 for Tier-II account. Overall the minimum contribution should be Rs 6,000 for Tier-I account and there is no maximum investment limit. The minimum balance for Tier-II account should be at least Rs 2,000 at the end of each financial year. There is no limit to the number of times you can make deposit. If the subscriber fails to make the above minimum contribution, a default penalty of Rs. 100 per year of default is levied and the account would become dormant. In order to reactivate the account, the subscriber would have to submit form Form UOS-S10 pay the minimum contributions (Rs 500), along with penalty (Rs 100), due for the period of dormancy. The dormant account will be closed if the account value falls to zero. 1. Section 80CCD(1) – Employee contribution up to 10% of basic salary and dearness allowance (DA) up to 1.5 lakh is eligible for tax deduction. [This contribution is part of Sec 80C 1.5 Lakh investment limit]. Self employed can also claim this tax benefit. However the limit is 10% of their annual income up to maximum of Rs 1.5 Lakhs. 2. Section 80CCD(1B) – Additional exemption up to Rs 50,000 in NPS is eligible for income tax deduction. This was introduced in Budget 2015. 3. Section 80CCD(2) – Employer’s contribution up to 10% of basic plus DA is eligible for deduction under this section above the Rs 1.5 lakh limit in Sec 80CCD(1). This is also beneficial for employer as it can claim tax benefit for its contribution by showing it as business expense in the profit and loss account. Self employed cannot claim this tax benefit. Government is trying everything to make NPS popular but it has still ignored the unfavorable tax treatment at the time of withdrawal. Also the compulsion of buying annuity at the time of withdrawing is another drawback as the annuity returns are not good. Also there is limited pre-mature exit option. To make it more popular, government needs to make it’s taxation and withdrawal rules similar to present EPF. what is the tax applicability for Tier 2 accounts? 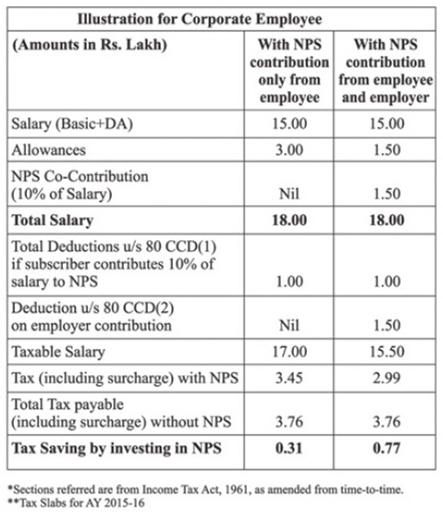 There is no clarity on how NPS Tier 2 accounts would be taxed. There are two ways to it. One to consider it equivalent of balanced mutual fund and so redemption would lead to capital gains. If the redemption is within 3 years, it would be short term while more than 3 years would give long term capital gains. Short term capital gains would be added to the income and taxed at marginal tax rate while in case of long term capital gains the tax rate is 20.6% after indexation benefit. The second opinion is to consider debt and equity part separately and calculate tax accordingly. Personally I see more merit in option 1 above.